Just as babies slowly learn to communicate in more and more complex ways, so the new believer should move from simply crying out to God to a developed prayer life. The basic elements of prayer found in the Lord's Prayer are a helpful guide to Christians hoping to enrich their prayers. In "On Earth as It Is in Heaven", beloved teacher and writer Warren W. Wiersbe explains and applies the elements of the Lord's Prayer to everyday prayer so readers get excited about maturing in their personal prayer ministries. Any reader wanting to experience a more satisfying and effective prayer life will cherish this thoughtful book. 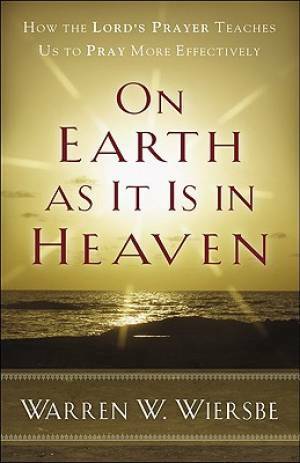 On Earth as it is in Heaven by Warren W. Wiersbe was published by Baker in March 2010 and is our 10520th best seller. The ISBN for On Earth as it is in Heaven is 9780801072192. This is a vibrant rethink to the model prayer of Jesus, yet prayer can be so often a struggle rather than the soul’s easiest sound. Baker Books have offered us a very talented and in-depth book that deals with the Lord's Prayer robustly. It's insight-fullness is extremely helpful in the study of this example prayer, and will work for a range of contexts. I found this incredibly inspiring. Wiersbe completely deconstructs the Lords Prayer, unveiling a basic model of prayer that calls me home to soulful obedience all over again. Densely loaded with scripture, in moving and wisely themed chapter segments, this offers maturity in a deeper connection with God. Wiersbe brings something fresh, clear and deeply-rooted! Got a question? No problem! Just click here to ask us about On Earth as it is in Heaven.